Cave Innovations launches yet another great outdoor product innovation, the portable Cobb BBQ. This ingenious mini BBQ is available in a range of different models with all the accessories you’ll ever need. Compact, yet big enough to roast a whole chicken, this award winning portable camping BBQ has an ingenious insulated design which makes the base cool to touch even whilst cooking! Used correctly this makes it a much safer camping BBQ to take with you on your next camping and caravanning holiday. 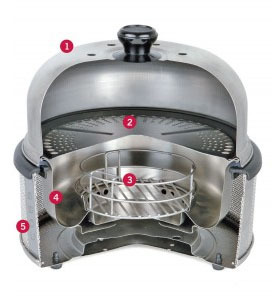 Dome: made from stainless steel with a heat-resistant handle. The design of the holes ensure even ventilation throughout the cooking process creating an oven effect. Grill Grid: features an easy clean Teflon® non-stick coating. Excess fat drains away through the holes into the moat. Fire Basket: this is a separate secured area for the Cobble Stone or loose briquettes. Stainless steel moat: catches all excess fat but can also be used for cooking vegetables. Base: with anti-slip rubber feet and insulated, the base remains stable and cool to touch during use. Ideal for one or two people this compact mini BBQ packs away into a small space. It has a host of accessories, which you can add as your outdoor culinary skills improve.